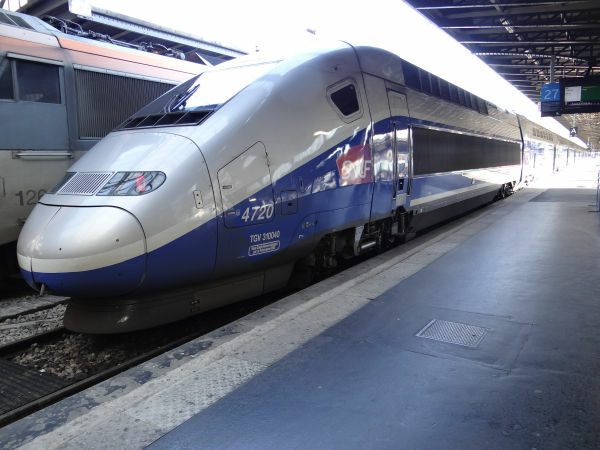 France is the proud user of the world's largest fleet of so called bullet trains which in France are referred to as TGV trains. 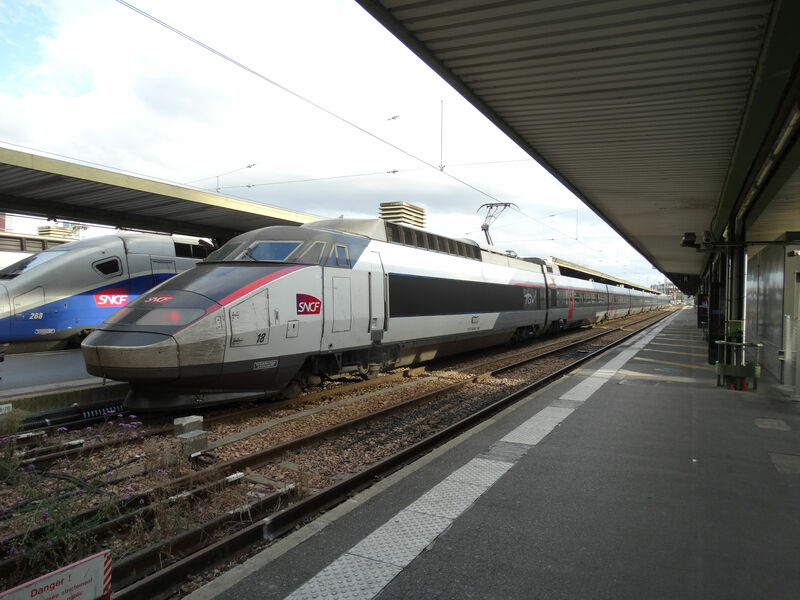 TGV stands for Train à Grande Vitesse or train of a high speed. The French state railways SNCF is now renaming their TGV service to "InOui" because they want a trade name which can be reserved exclusively just for them. TGVs have been around already for quite some time and although they all look fairly similar, there is a multitude of TGV train families already. This page tries to show some examples of the various TGV types. 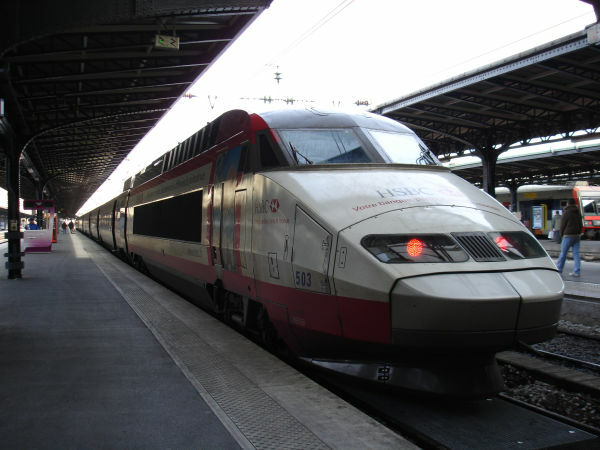 TGV Sud-Est, first generation TGV. Known also as TGV PSE. The one on the right, no. 96 is one of the first generation TGV units of the so called TGV Sud-Est series. They were built by what then was GEC-Alsthom between 1878 and 1988 in 111 copies. Many have been scrapped already. It is a ten car set with a seating capacity for 350 passengers. 9 sets have a three current setup for 1,5 kV DC, 25 kV AC and Swiss 15,6 kV AC, but most have dual current systems. The train on the left, no. 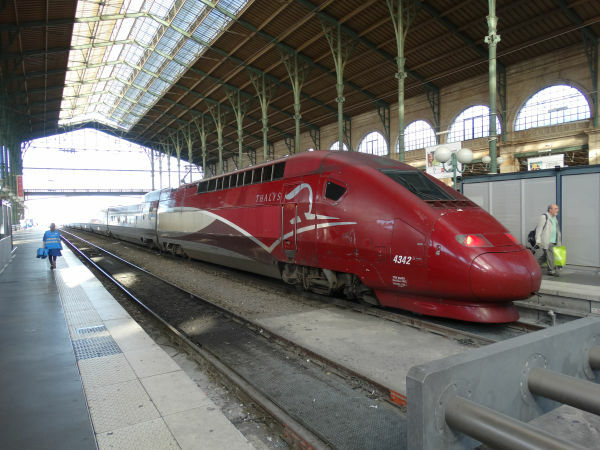 4306 is a Thalys PBKA TGV. PBKA stands for Paris-Brussels-Köln-Amsterdam. They are quadri-current, operating under 25 kV, 50 Hz AC (LGVs), 15 kV 16⅔ Hz AC (Germany, Switzerland), 3 kV DC (Belgium) and 1.5 kV DC (Dutch and French lignes classiques). Picture from Paris Gare du Nord 27.1.2008 by Sanna Siissalo. One of the very oldest TGV trains, the unit no. 18 in the very new whitish livery after refurbishments. 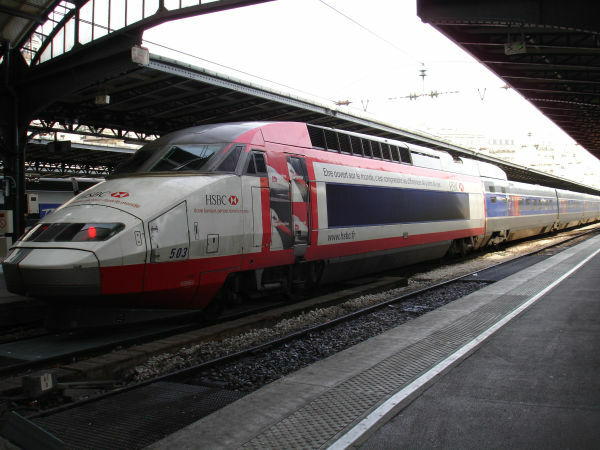 This is one of the dual voltage TGV Sud-Est units with a top speed of 300 km/h, with 350 seats and 10 coaches. In the background a TGV Duplex unit of the 2xx series. Picture from Paris Gare de Lyon station 19.10.2017 by Ilkka Siissalo. 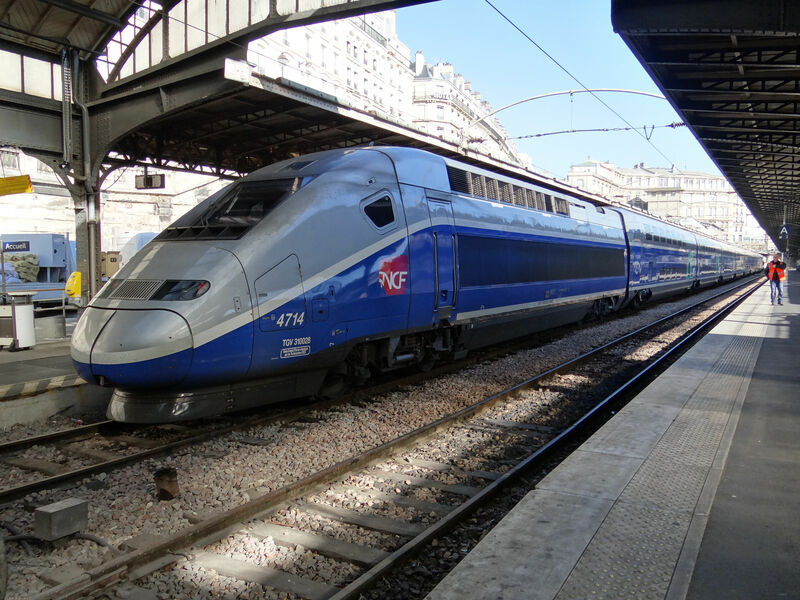 A similar TGV-PSE no.11 at Paris Gare de Lyon. Picture 4.3.2014 by Ilkka Siissalo. 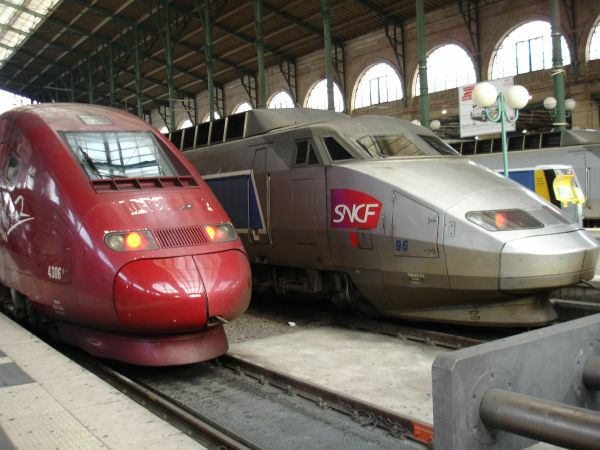 Two sets of TGV Atlantique. They were built by GEC-Alsthom 1988-92 in 105 copies. It is a 12 car trainset with originally 485 seats (later 459). This is the second generation of TGV trains and it can operate both on 1,5 kV DC and 25 kV AC. Picture from Paris Montparnasse station 27.1.2008 by Sanna Siissalo. These TGVs numbered 5xx were built 1992-96 and they can operate under both 1500V DC and under 25kV AC. One unit consists of one power car plus 8 coaches plus another power car. Numbered 501 to 550. Picture from Paris Gare de l'Est 5.3.2014 by Ilkka Siissalo. Another example of a bicurrent TGV Réseau, this no. 536 is seen in the newest whitish livery. Picture from Paris Gare de l'Est 5.3.2014 by Ilkka Siissalo. Another view of the same unit no. 536 as in the picture above. Picture from Paris Gare de l'Est 5.3.2014 by Ilkka Siissalo. It's another TGV Réseau, but one of the very few ones that has ever received an advertisement taping, here advertising the HSBC bank. This one is a dual current version 25 kV AC + 1,5 kV DC. The ones numbered 45xx ate trple current models, also capable of handling 3 kV DC. Picture from Paris Gare de l'Est 27.1.2008 by Sanna Siissalo. Same train as above, but seen more from the side of it. Picture from Paris Gare de l'Est 27.1.2008 by Sanna Siissalo. 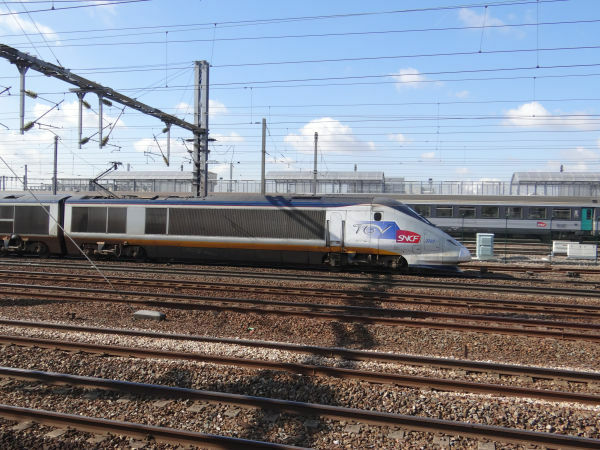 This one is a Eurostar train, although here seen with SNCF TGV logos and operating in France for the domestic services. The Eurostar trains, intended for traffic between continental Europe and the UK via the channel tunnel, are technically TGV trains, although longer. There were altogether 38 of these train sets, ordered jointly by the national state railways of France, Belgium and the British Rail. Two types of these trains were built: The so called Three Capitals set, which was 18 coaches plus two power cars long and the so called North of London sets, which were intended for extending the channel tunnel traffic to also northern parts of the British Isles and which were 14 coaches plus two power cars long. 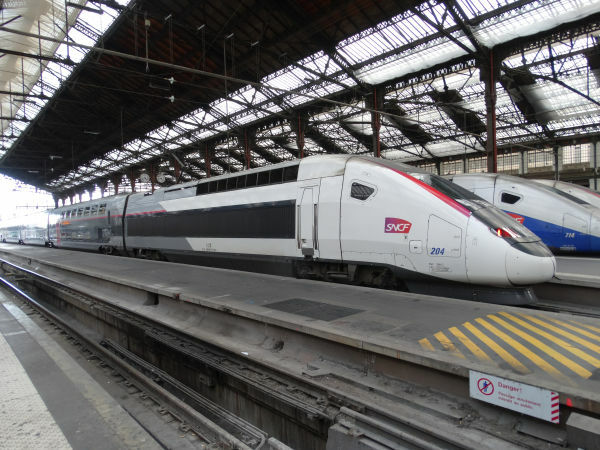 SNCF of France used three of the Three Capitals sets in domestic use between Paris and Lille until autumn of 2014 and this is one of them. They were replaced in October 2014 by regular TGV Duplex trains. Picture from Paris Gare de l'Est 5.3.2014 by Ilkka Siissalo. Another view of the same Eurostar train as above. Not only the first coach has engines, but also the very front of the very first passenger coach has motors. 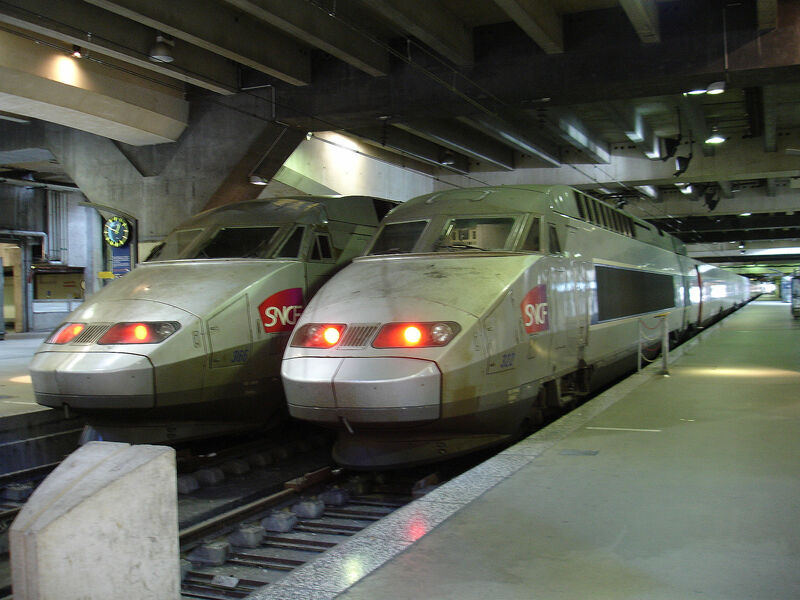 These trains are right now or have been already been replaced by Siemens Velaro trains in their original use as Channel tunnel trains. The Velaros have motors in all coaches, not just at the front and at the end. Picture from Paris Gare de l'Est 5.3.2014 by Ilkka Siissalo. 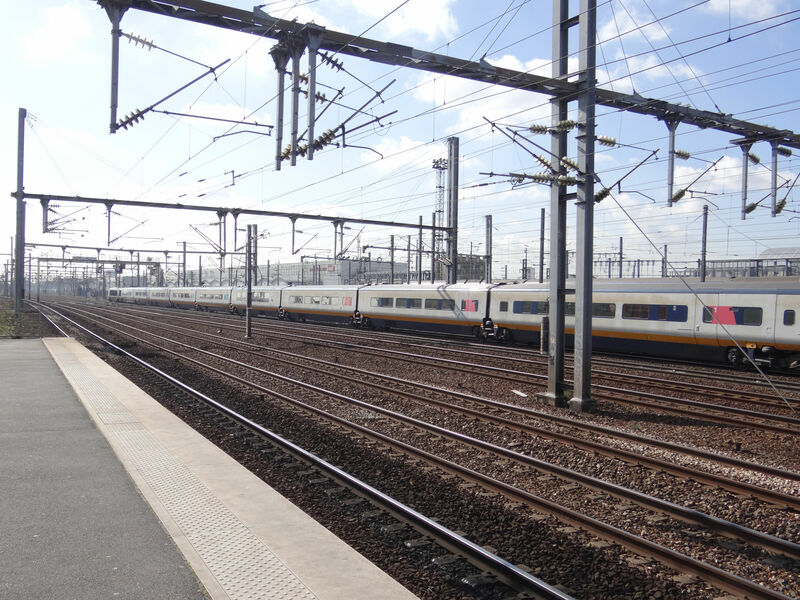 A third view of the same Eurostar train, here operating as a TGV between Paris and Lille. Picture from Paris Gare de l'Est 5.3.2014 by Ilkka Siissalo. 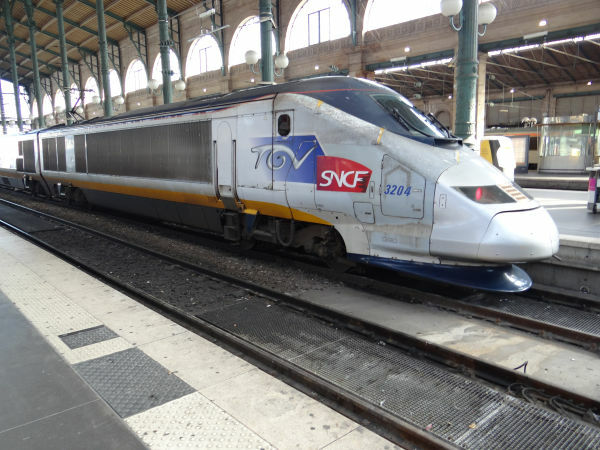 Another one of those Eurostar trains which SNCF used in domestic TGV traffic until end of 2014, here no. 3203 in speed passing the station of Stade de France. Picture 5.3.2014 by Ilkka Siissalo. The other end of the same passing Eurostar train as in the picture above. Old Eurostar units are surprisingly long compared with the usual TGV trains. Picture at Stade de France 5.3.2014 by Ilkka Siissalo. The TGV POS series numbered 44xx consists of new TGV Duplex type of power cars modified to suit also the networks of Switzerland, Germany and Luxembourg and used Réseau coach sets which were just modernised. Picture from Paris Montparnasse station 27.1.2008 by Sanna Siissalo. Another TGV POS. Picture from Paris Montparnasse station 27.1.2008 by Sanna Siissalo. Thalys PBKA TGV trains are very similar to the TGV POS trains, but they have been designed to run in France, Belgium, The Netherlands and Germany and therefore have a four electrical systems configuration, operating under 25 kV, 50 Hz AC (LGVs), 15 kV 16⅔ Hz AC (Germany, Switzerland), 3 kV DC (Belgium) and 1.5 kV DC (Dutch and French lignes classiques). Picture from Paris Gare du Nord 27.1.2008 by Sanna Siissalo. Another Thalys PBKA TGV at Paris Gare du Nord. 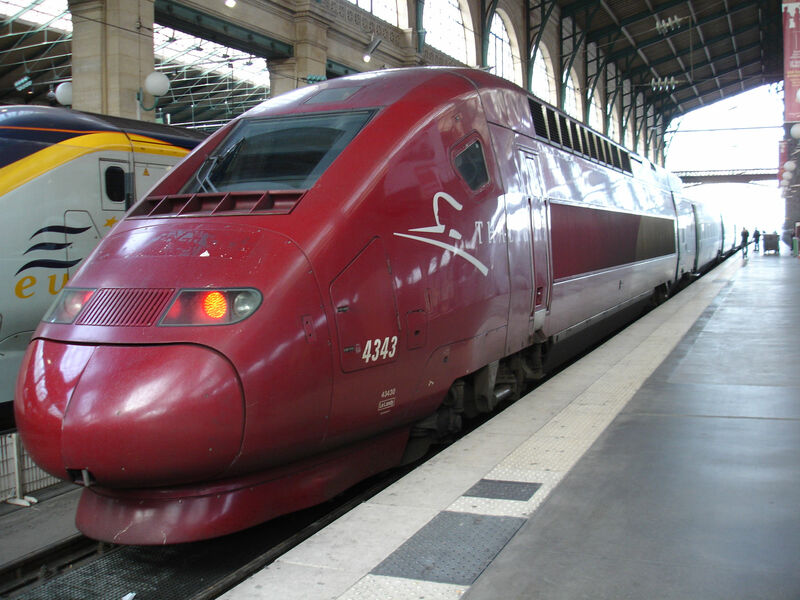 For even more pictures of Thalys trains, please see this archive railpics.club -> Belgium -> Thalys+Eurostar. Picture from Paris Gare du Nord 20.10.2017 by Ilkka Siissalo. 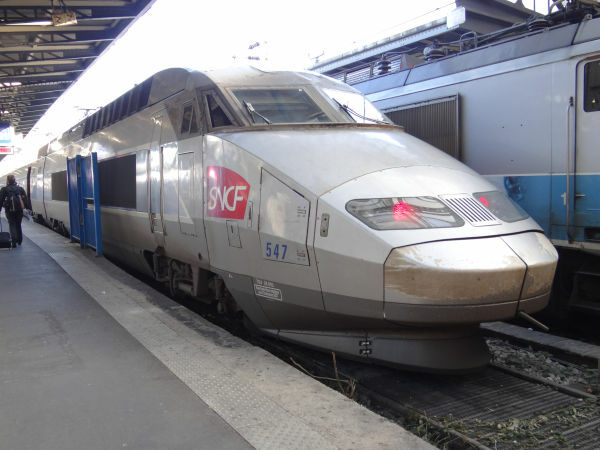 This is the "original" TGV Duplex train. 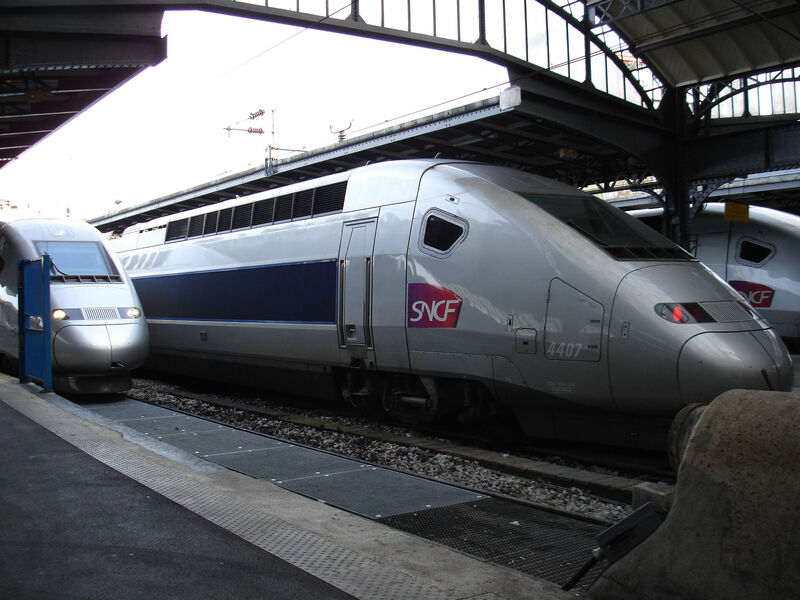 New power cars similar to those in the TGV POS variant, but with double decker coaches. Alstom produced 89 Duplex trainsets 1995-2012. 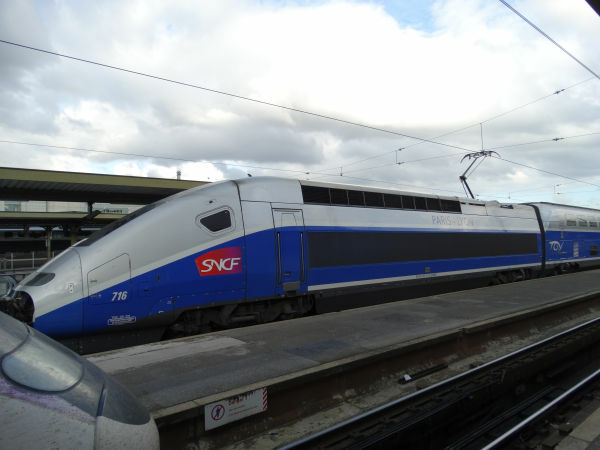 It is a 10 coaches long train with seating for 508 passengers, capable of running under both 1,5 kV DC and 25 kV AC, but only in France. Top speed is 320 km/h. 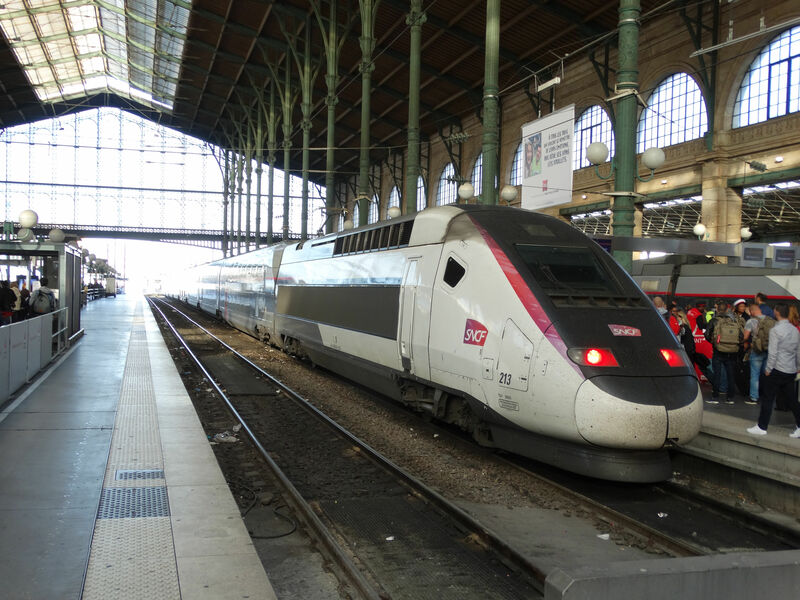 Picture of a TGV Duplex set at Paris Gare du Nord 20.10.2017 by Ilkka Siissalo. Another TGV Duplex in the very newest whitish livery. 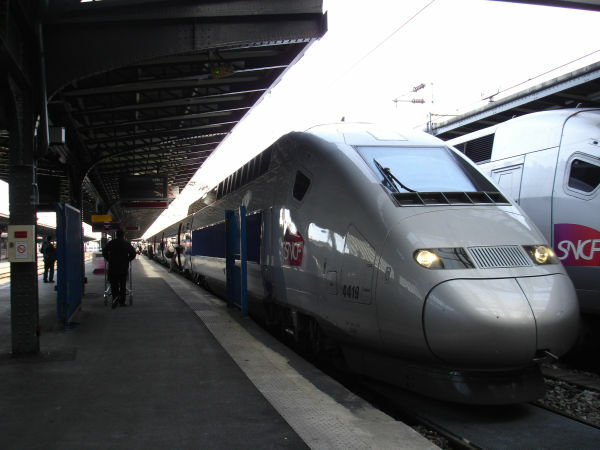 In the background a TGV Dasye in the 7xx series numbering. Picture from Paris Gare de Lyon 19.10.2017 by Ilkka Siissalo. 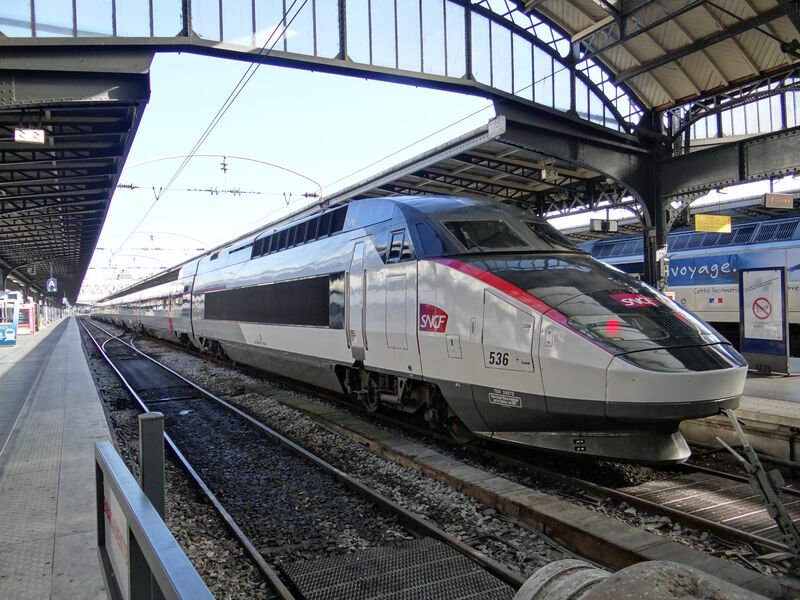 A TGV Dasye is a Duplex TGV, but it is fitted with the ERTMS train control system, intended especially for use on the Perpignan-Figueras line towards Spain. They are numbered in the 7xx series. Dasye stands for Duplex Asynchronous ERTMS. Picture from Paris Gare de Lyon station 19.10.2017 by Ilkka Siissalo. 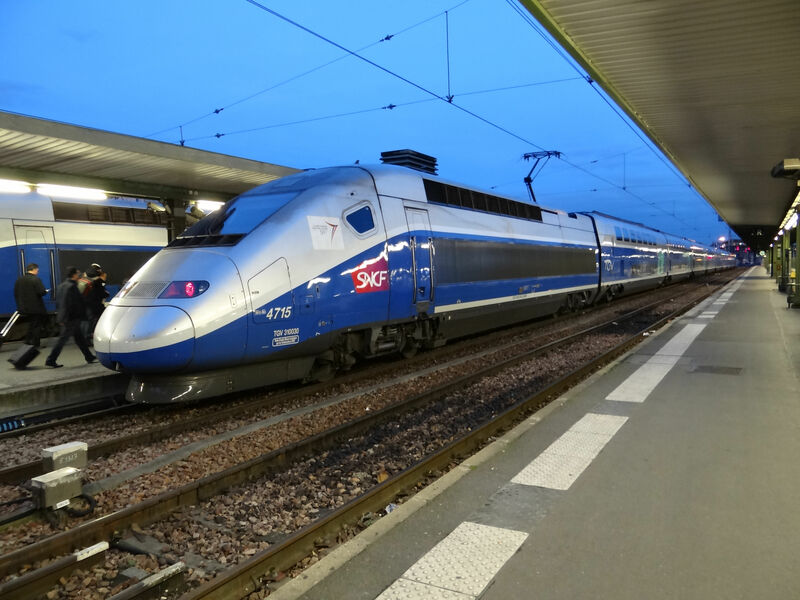 The TGV subtype 2N2 is the newest doubledecker TGV. They have been built since 2011. Not only SNCF of France but also ONCF of Morocco uses them. This example is from the subseries "3UA" (tricurrent Germany), numbered 4701-4730 (4=international) for services from France to Germany and Switzerland. This type has 2 power cars and 8 powerless coaches and has either 509 or 556 seats. Picture from Paris Gare de l'Est 5.3.2014 by Ilkka Siissalo. 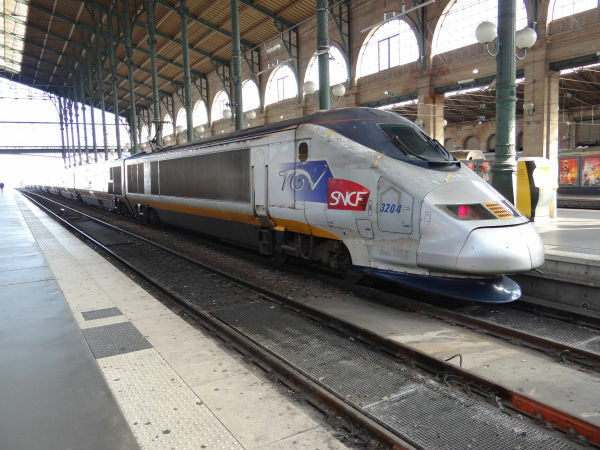 Another similar TGV 2N2 tricurrent train as above. Picture from Paris Gare de l'Est 5.3.2014 by Ilkka Siissalo. A nice picture of yet another TGV 2N2 3UA no. 7415, here ready to leave towards Switzerland. This train has a small sticker by its driver window commemorating the 50th anniversary of the versailles treaty. Picture from Paris Gare de Lyon 4.3.2014 by Ilkka Siissalo. 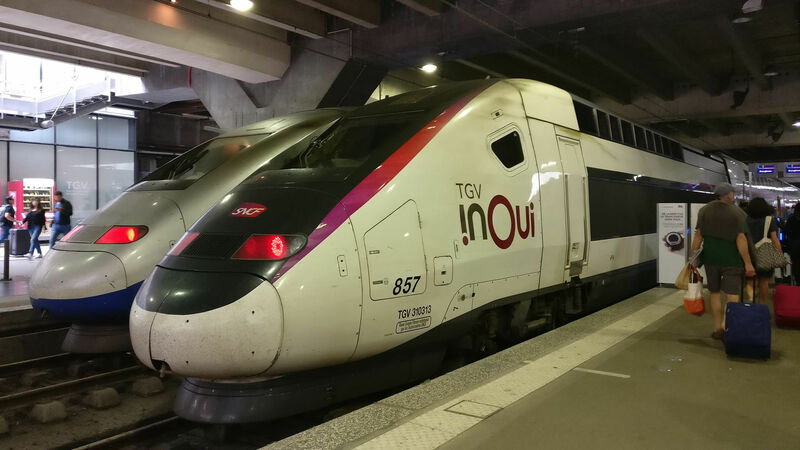 Beginning from 2018 SNCF is gradually renaming its TGV trains under the new trade name "inOui". 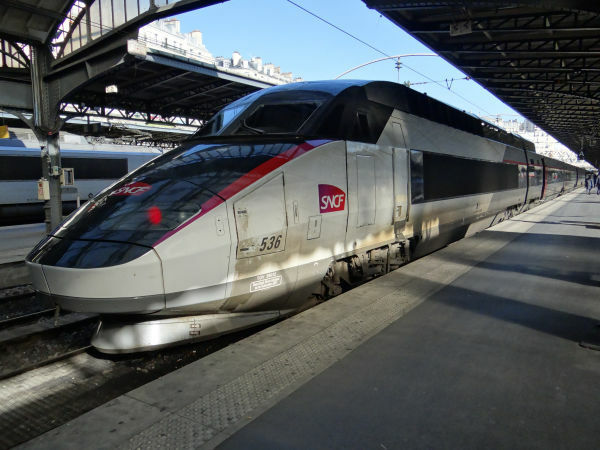 This inOui train is a TGV 2N2 3UFC, also known as L´Oceane. 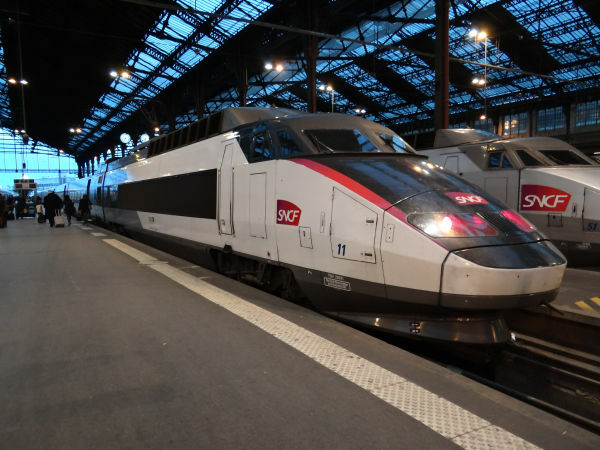 It is a third generation double decker TGV with three different electric current systems, here used on the Paris to Bordeaux service on the new high speed line called LGV L´Oceane. Picture from Paris Montparnasse station 9.6.2018 by Outi Tasala. 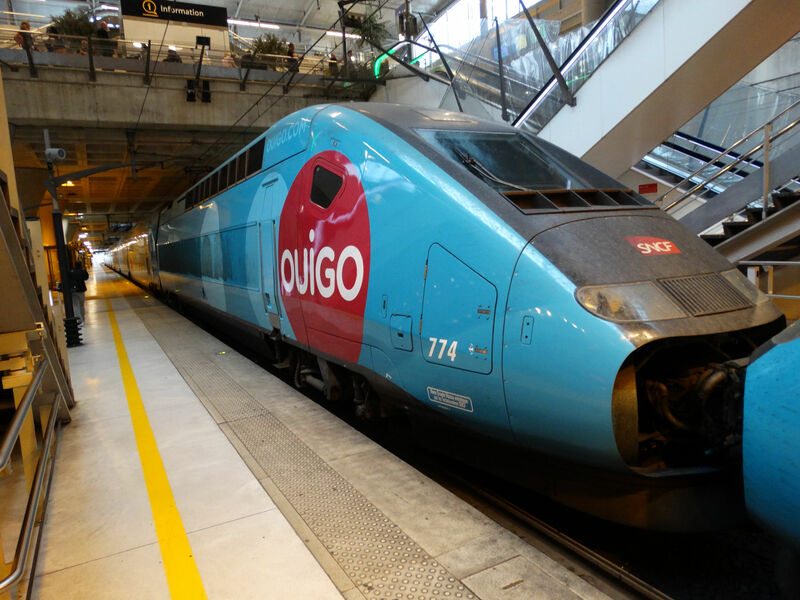 SNCF is also trying to compete with cheap flights with their new TGV brand "Ouigo". A small number of TGV trains have been refitted so that the chairs are really tightly packed, the trains run almost all the time and for example in Paris they never come to the city center, but the lines end far away, for example n Paris at Marne la Valleé and then the passengers have to use a regional train to get into the city. Also large baggage is not allowed on board these Ouigo trains or else a hefty fee has to be paid. Picture of an Ouigo TGV from Marne la Valleé station by Ilkka Siissalo 19.10.2017. 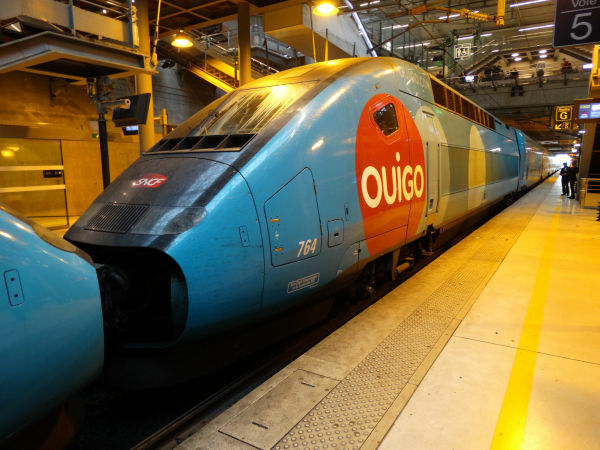 Another Ouigo TGV. 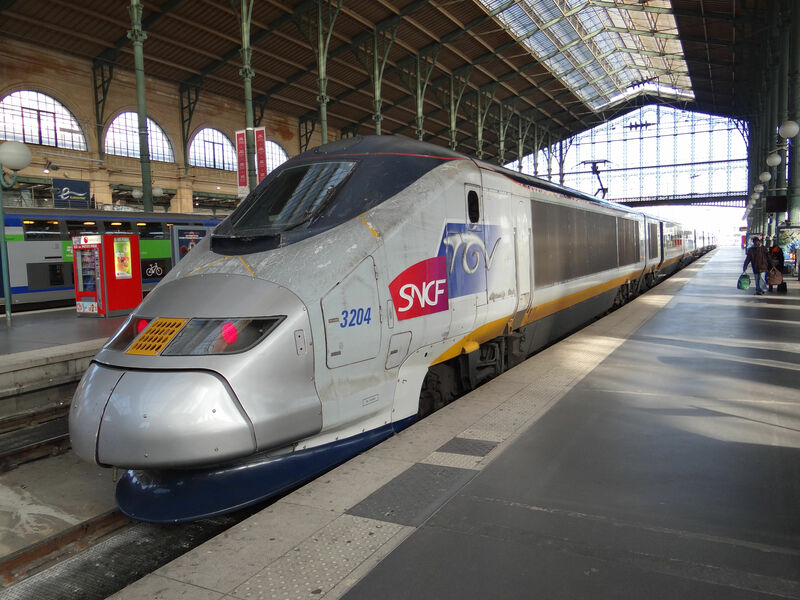 These are quite normal TGV Dasye trains, but with a new painting and huge Ouigo logos. 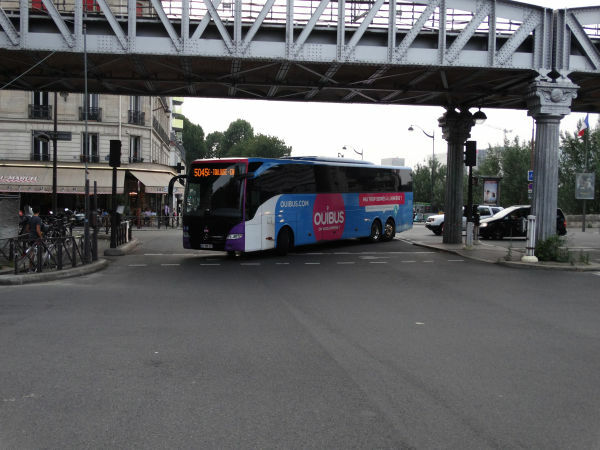 The Ouigo TGV offering has now been extended also with SNCF's own Ouibus cheap long distance buses. 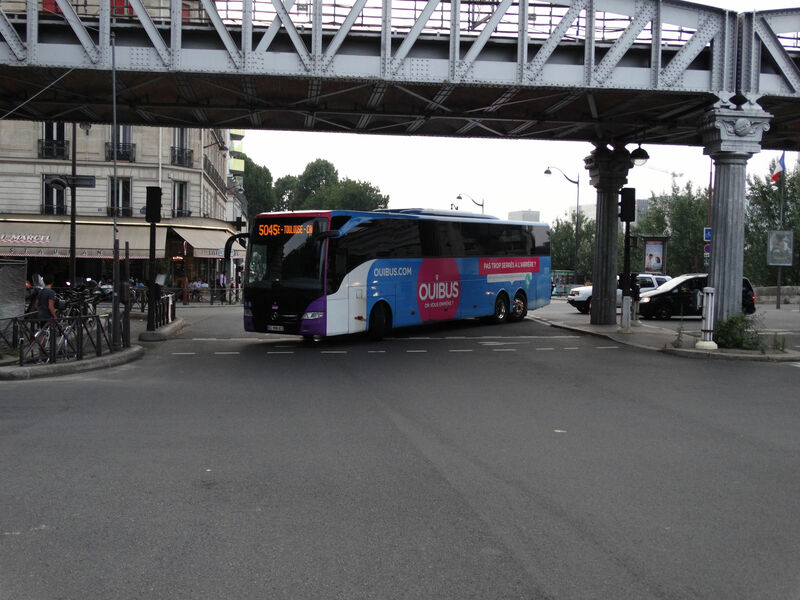 Here an Ouibus is just about to leave Paris towards Toulouse. Picture from Paris Quai de la Gare metro station 5.6.2018 by Ilkka Siissalo.